Dumb to the point of being (kinda) brilliant, ATL-based Smushion's a pillow-like creation functioning as a coffee table ottoman, an arm rest (w/ hole for your remote! 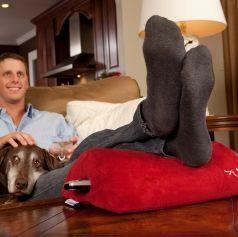 ), a lap desk, or...whatever, stuffed w/ memory foam and covered w/ machine-washable microfiber suede in four colors. The thing was conceived by a brother/sister team who call themselves "comfort seekers" and "champion nappers" -- and after a project like this, it's amazing neither is re-tired.